Breyden and his entourage are heading of of Revelstoke today. After a rest and the return of his wallet Breyden is all set to resume his walk. His Grandparents, Norma and Al, have generously decided to get their motor home (which the family affectionately calls 'The Mother Ship') road ready for a long trip this time and will be following Breyden along as a support vehicle. While he still will be walking about 30 kilometers a day, Breyden will at least have a comfortable bed and good food each night. Thanks so much mom and dad for your generosity. This will make it much easier for him as well as he will not have to be carrying his extremely heavy backpack every step of the way. They also had some banners made up to attach to the outside of the motor home to announce Breyden's Cross Canada Cure 2013 to passersby . Funding for this was donated by local a local merchant and his Grandparents and other assistance by some of the local church members. More details on that soon. 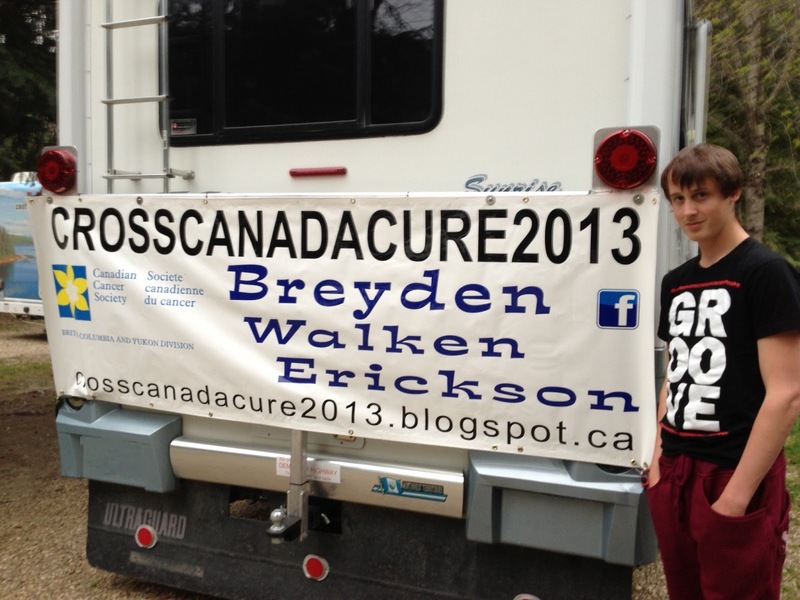 Here's a picture of Breyden with one of the Banners for the motor home. I'll have some more pics soon.